Need some help getting started? You’ve come to the right place. Why not start with this brief overview video? If you're hungry for more detail, read on, or jump directly to the relevant section below. You should have a file called HighFrontier-Mac.zip (or HighFrontier-Demo-Mac.zip, if you have the demo). Double-click this zip file to unpack it. Drag the HighFrontier (or HighFrontier-Demo) application wherever you want to keep it (such as your Applications folder). Double-click the application to play. You should have a file called HighFrontierSetup.exe (or HighFrontierDemoSetup.exe, if you have the demo). Just run this installer, and follow the prompts. You can even have it install an icon on your desktop for easy access! You should have a file called HighFrontier-Linux.tar.gz (or HighFrontier-Demo-Linux.tar.gz, if you have the demo). This should produce an executable called HighFrontier.x86, and a folder called HighFrontier_Data (or the corresponding _Demo versions of these). Move the executable and the data folder wherever you want to keep them. The executable and its data folder must be kept together. Launch the executable to play. This menu lets you manage multiple High Frontier games, in case other people in the family want to play, or you just feel a need to conquer more than one solar system at a time. The top button always resumes the last game played, but since you've never played before, that button is disabled. So click the New Game button in the middle, and you'll see another dialog like the picture at left. Here you can name your game (simply using your own name is a good choice), and pick a game type. New players should always leave the game type set to Standard. Then, click the Play button to begin! 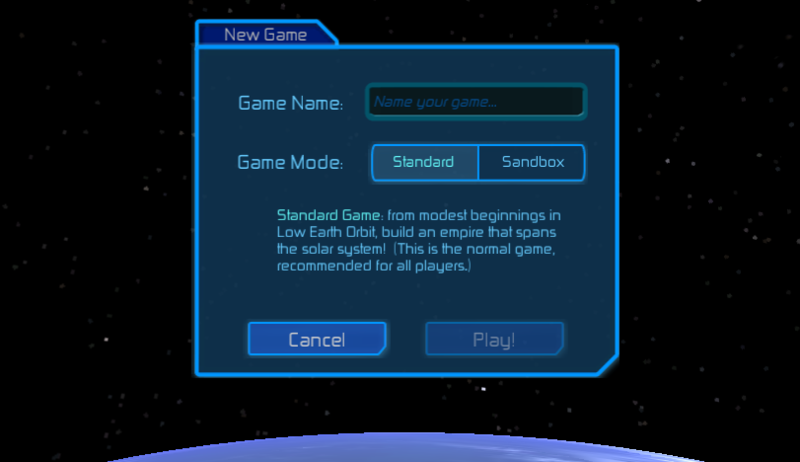 Once you start a game, you'll find an Options button in the lower-left corner of the screen. Clicking that brings up the Options dialog. Here you can adjust the display size, music volume, and input controls used by the game. We recommend using a resolution of at least 1024 x 768. 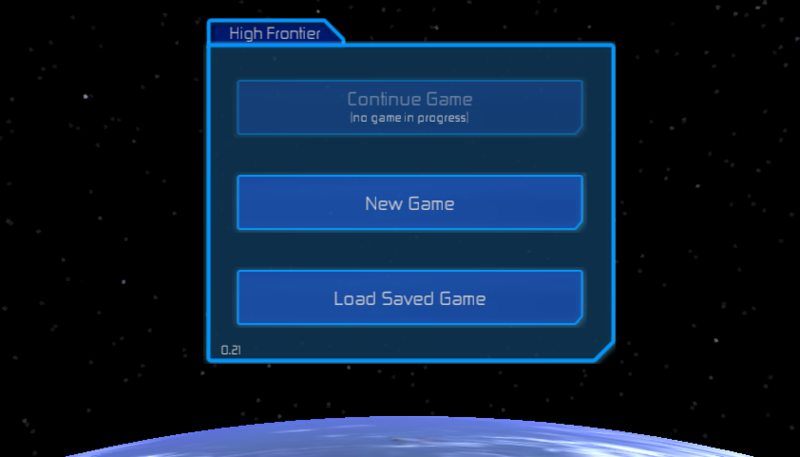 Set Full Screen to OFF if you want to run High Frontier within a window; turn it ON if you prefer to play full-screen. 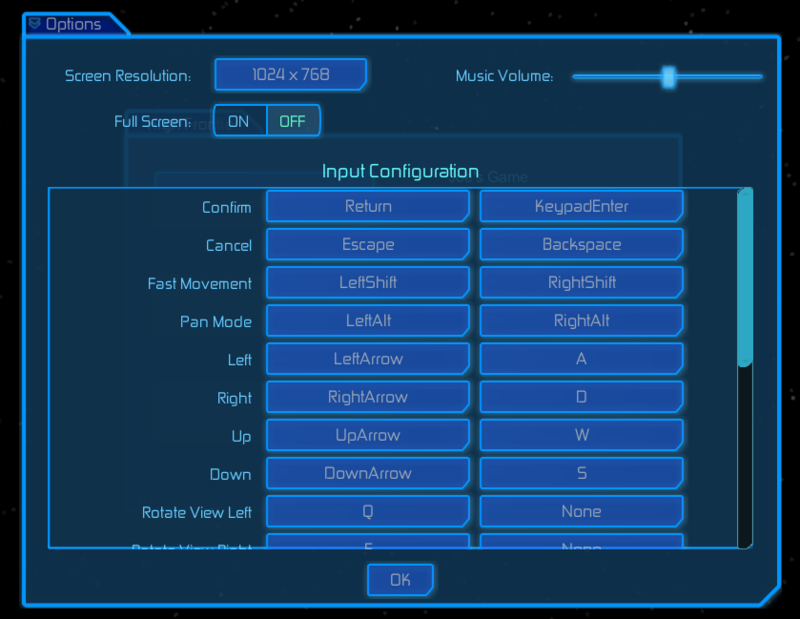 We generally recommend leaving the Input options alone, but you can certainly tweak them if needed. When you're ready, click the OK button to resume the game. 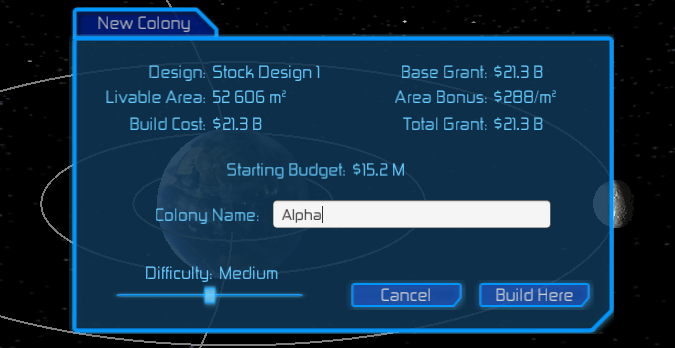 Designing a colony consists mainly of snapping together components from the parts library and configuring their properties, all while keeping an eye on the Analysis tab to see how your design is turning out. The short video below explains the process. High Frontier is still under active development, and a few things may have moved around a bit. But the process shown above is still the same. 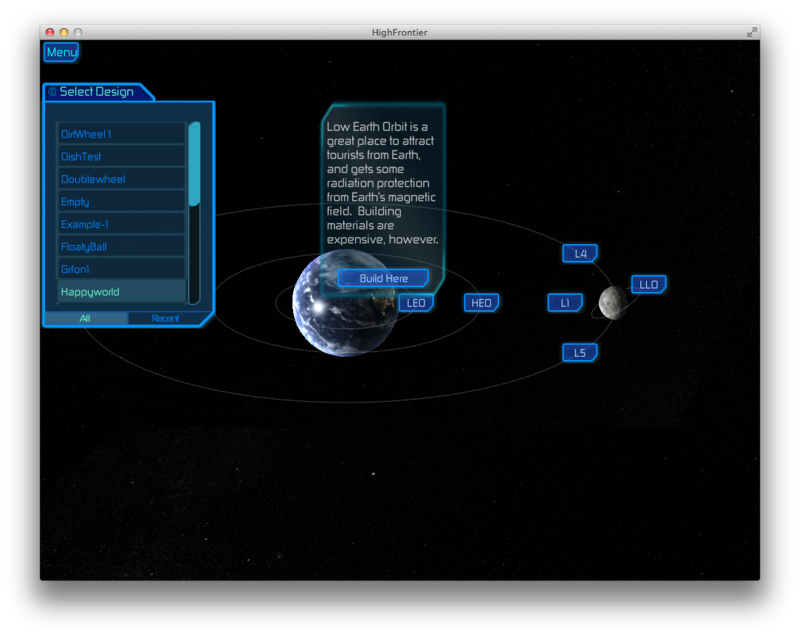 Build mode is easy: just select the design you want to build, and the orbit you want to build it in, then click the Build Here button! Note that the available orbits depend on what Projects you have done. Check out the overview video at the top of this page to learn more about that. Check out the short video below for a tour of management mode. This video was made with High Frontier version 0.12; we're on 0.27 now, so a few things have changed — see notes below the video. 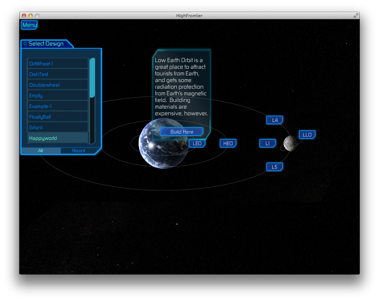 The Statistics palette now includes tabs for Economy and Environment, with useful info in each. Paths can now include bends; to finish building a path, double-click the last point, or press Return. As your city grows, you will see people appear and go about their business (though you may have to zoom in to make them out).